My Little Shoebox: Oh Deer! Layout and Mini Album Ideas with Oh, Deer! Hello! 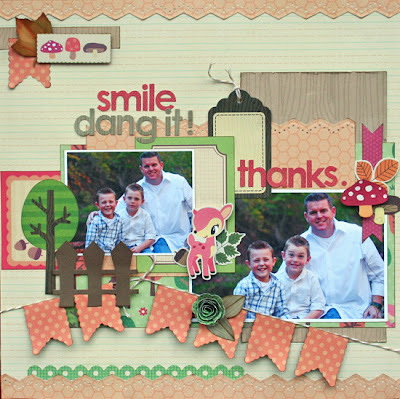 Liz here today to share with you a few layouts and a mini album using our Oh, Deer! collection. And finally, the My Little Shoebox team and I were lucky enough to receive mini albums from Punky Sprouts. These albums are so fun and unique, I really enjoyed creating with them. 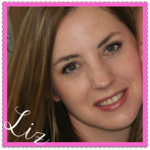 Products used: My Little Shoebox's Oh, Deer! 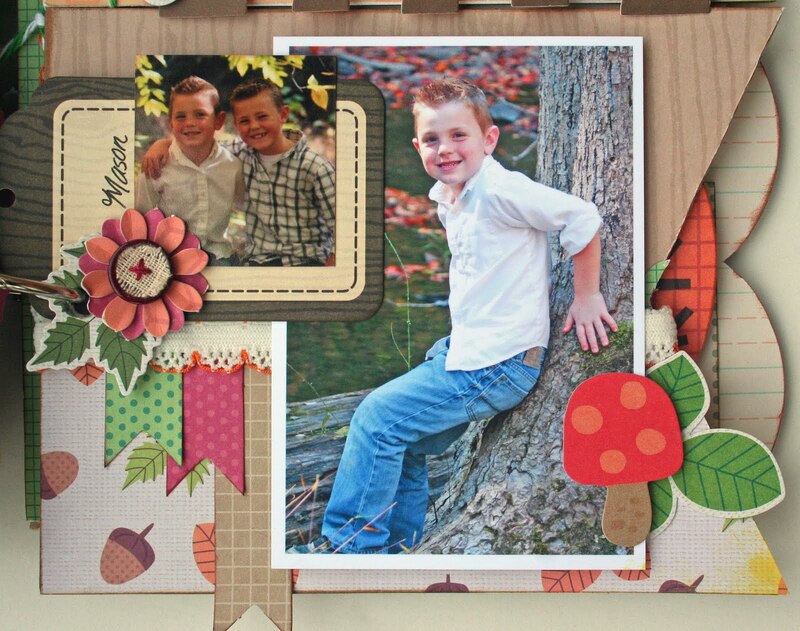 collection; Creekside Trail, A Walk in The Woods, Knock on Wood, Happy Campers, Cardstock Stickers, Woodgrain Muse Alphabet Stickers, Firecracker Muse Alphabet Stickers, Chocolate Cake Mini Alphabet Stickers, 3D Roll-Up Flower and Accent sheet. An "Oh, Deer!" Punky Sprouts mini album! Hello My Little Shoebox Friends! During the hectic month of December I had so much fun "unwinding" with this fun mini album from Punky Sprouts and MLS' Oh, Deer! collection! 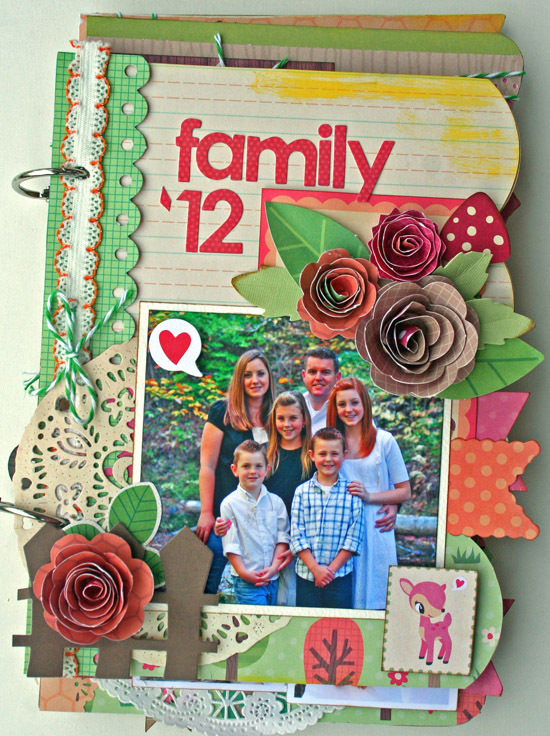 I find nothing more relaxing than creating a mini album.... every day I do just one page, no hurry, just having fun with this awesome collection! And this is the Punky Sprouts album I used: "Soul Sprout"
I really loved this album; no two pages are the same even the texture of a lot of pages is different! And although the Oh, Deer! collection is all about nature and woods and little animals living in those woods it worked perfectly with my city-photos! MLS supplies: Oh, Deer! 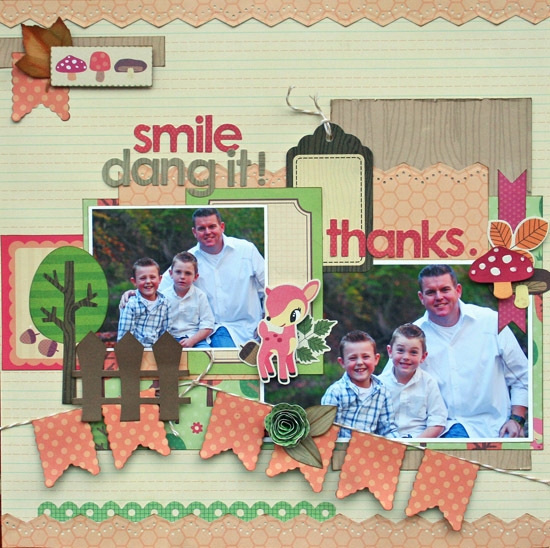 collection: Patterned Paper: Creekside Trail (50051), A walk in the Woods (50052), Knock on Wood (50053), Happy Campers (50054); 3D Roll-Up Flower and Accents (50055); Cardstock Stickers (50056); Muse Alphabet Stickers: Woodgrain (50106), Newsprint (50102); Mini Alphabet Stickers: Apple (50156), Cream (50152); Trim Pack: Morning Mist (50057). 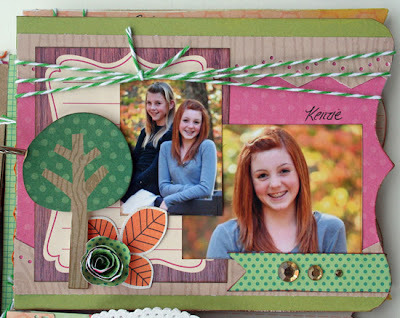 Other supplies: Punky Sprouts mini album "Soul Sprout"; Flowers, Words-To-Go, Pen: K&Company; Chipboard Words: Maya Road; Twine: The Twinery; Wood Veneer Shapes: Studio Calico; Pen: Stabilo; Stamping Ink: ColorBox and VersaMagic; Doilies: Royal Lace, Pipoos; Embroidery Thread: misc. That's it for today! Thank you so much for visiting MLS' blog and hope you enjoyed my album. Mixing It Up with Oh Deer! Hello, MLS friends! 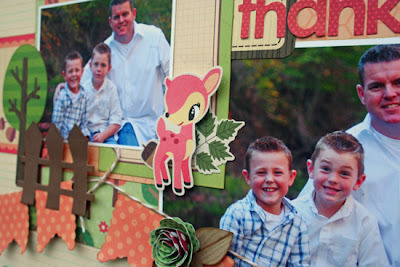 It's Robyn with you today to share my projects with the Oh Deer! collection. Each year, we spend Thanksgiving at a cabin on the lake, and I always take some photos of the girls. It's interesting to see how they change from year to year. I love this photo I snapped of my youngest daughter, and it worked perfectly with the papers. I mixed a lot of different edges on this layout, including the die-cut border strip and the woodgrain tag sticker. I also used an edge punch with pink cardstock to add another detail to the page. A couple of strands of twine, looped loosely through the tag, created yet another shape. I used a tiny glue dot behind each loop to hold them in place. For my next project, I decided to alter a journal I purchased from the clearance bin at Staples a while back. It had a really bright green cover, which was easy enough to cover up with the Oh Deer! papers and stickers. I used washi to cover the binding and finished it with a paper clip and seam binding trim. Hope you're having a fabulous fall! 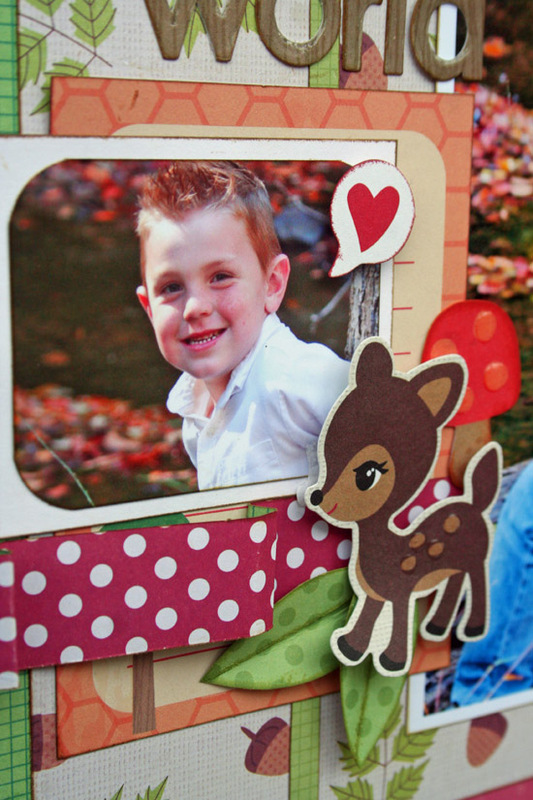 Hi Jenifer here with you today to share some fun cute projects with you using the Oh Deer collection. First up is this fun Fall Mini. I used every single piece of paper and scraps in this mini, one fun thing I did was use copper embossing powder around all the edges so it looks like it is soddered together. Next up are a couple cards I made using the rest of my papers and cardstock stickers. How cute is this little deer? I could use them on everything. This one is a super quick card to just let someone know you are thinking of them. 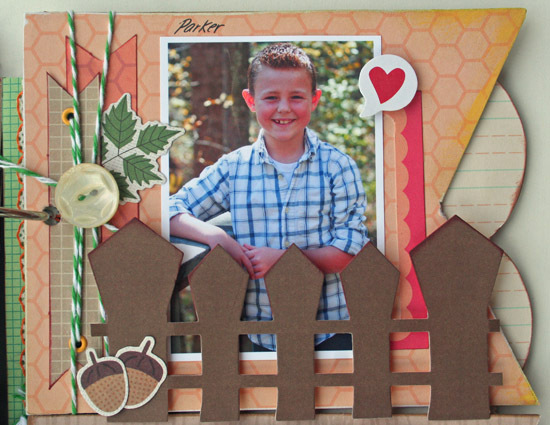 I hope you have enjoyed my projects today, make sure you come back tomorrow for even more inspiration. First I would like to share with you a little notice board I altered. It started out life as a plain cork board which I covered with the papers. The patterned paper with the deers on is a fun background for when you haven't got the board filled with notes!! The 'Oh Deer' trims were perfect for the criss cross and the 3D roll up flowers embellished the joins. Around the edge of the notice board I used some punched out leaves which added some texture to the board. Of course I couldn't resist those cute deers from the cardstock sticker sheet!! The muse alphabet stickers are perfect for adding a name to the board too. This is a centre stepper card. I love how you can create 3D scenes with this style of card. 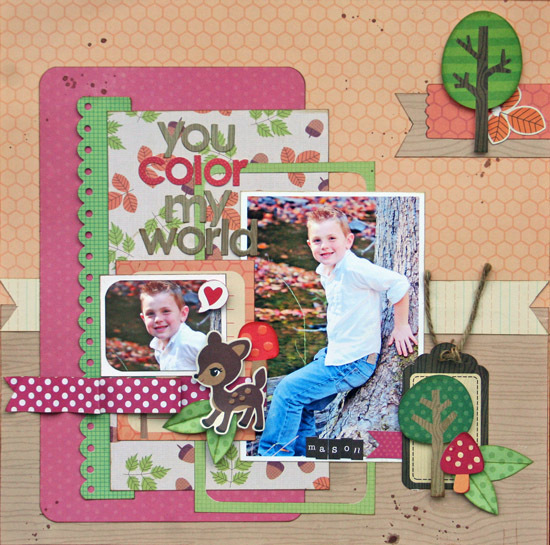 This card uses the co branded stamps from Unity, 'you make me mushy' and were coloured in using the Kuretake kurecolors. I have a few more cards made using this stamp over on my blog. Before I got today we'd like to share the Epiphany winner from Friday's post! Congratulations! Please email your address to dt@mylittleshoebox.com so we can get your prize to you.